Room [Book Review] – my books. my life. So this review is really late. Which is because Jennifer from Literate Housewife and I read it together and planned on doing a joint review. But then we kind of became slackers and never did it. She posted her review last week (go read it) so I am now posting mine. It’s Jack’s fifth birthday. He is perfectly happy to celebrate it with Ma in their Room. But Ma has other plans. Jack is finally old enough to help her leave Room. But Jack doesn’t want to leave the only place he’s ever known. Room received A LOT of buzz. So I had pretty high expectations when I finally began reading it. And it lived up to it. Room is told from the point-of-view of five-year-old Jack and the language is his. Donoghue actually manages to pull this off without dumbing down the book or creating an annoying narrator. Through Jack we are able to discover how Jack and Ma ended up where they are and what Ma’s plan is. We can see how depressed Ma is even if Jack doesn’t understand it. Room filled me with many emotions: sadness at their life, anger at the person who did this to them, terror when they take action, and hope for their future. It’s a difficult subject, but Room was hard to put down. It’s weird how angry I get about this book. My review was not favorable (thanks for the link love BTW) but the more I hear about it, the more I hate it. It just won the Tournament of Books round against Bad Marie. It’s absolutely discussable, which is why I think my book club picked it but I just felt that that 2nd half fell apart. Had it been a stronger 2nd half, I think I would have loved it. Disagreement! Isn’t this what we love about books? Re: TOB, Jen (Devourer of Books) made a good argument. Room got mixed reviews while Bad Marie (which I also loved) got only good reviews abs therefore should win. I liked both books but I think she made a good (if in vain) point. i read this over christmas and loved it! it’s fun to read something written from a totally different perspective than the norm! I liked it, didn’t love it. I figured it what was going on pretty quickly so maybe that was part of it. The other part is thate while I felt badly for Jack, at time I found him annoying and ready to hear from someone else. I liked the 2nd half of the book much better. I liked learning about how they were adjusting and readjusting to the world. That is what I found interesting. 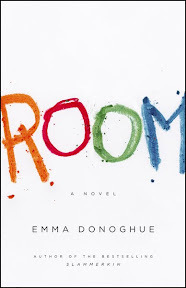 Pingback: Book Review: #104 – Room by Emma Donoghue | Let's eat Grandpa!